As an American Muslim, I am proud of the frontline role the organization I direct, the Center for Islamic Pluralism, has taken regarding women's issues in our faith community. The Center has produced numerous documents on the crime of female genital mutilation and other atrocious practices inflicted on Muslim women. These include so-called "honor" murders, forced marriage, forced divorce, marriage contracted with minor females, and other abusive habits found in Arab countries, Iran, Iraqi Kurdistan, Pakistan, Southeast Asia, and the immigrant Muslim communities in the West. In 2009 our Center produced a major study of shariah agitation in Western Europe that addressed these problems forthrightly. I note with great dismay that such social pathologies affect especially our Turkish and Kurdish coreligionists. I oppose imposition of hijab (the headscarf), which should be worn by Muslim women exclusively by their own choice. I believe that hijab should not be adopted to suggest that a Muslim woman with her head wrapped by an ostentatious covering is a better Muslim or "more Islamic" than a Muslim woman who rejects hijab. Almighty Allah (s.w.t.) knows the modesty and virtue of Muslim women, and alone possesses the capacity for judgment of their belief, conduct, and repentance. Allah is not anthropomorphic in Islam. Allah possesses neither a physical body, nor a specific place in the universe, nor, above all, a gender. I condemn dictation of radical covering (the abaya, or Wahhabi-style cloak), niqab (the face veil), the burqa, the chador, and other un-Islamic customs on women. These pretexts for oppression of females arose, in my view, in societies where males wished to deny women the right to be seen, because women were considered valuable property. Niqab is, above all, an obnoxious practice. So are prohibitions on gender mixing and women working with men. None of these customs has a sustainable basis in Islamic tradition. I abhor divorce by triple declaration of the husband (talaq). This unjust procedure should be prohibited by the scholars of Islam as well as by governments. Muslim women must be allowed to pursue professions where they mix with men to whom they are not related. As for rules considered Quranic, but today viewed as objectionable by women, polygamy stands out. Polygamy is disappearing from our Muslim ummah, Alhamdulillah! Another prescription in Qur'an, collection of the jizya tax from non-Muslims under Muslim rule, is no longer in effect in any Muslim country. Polygamy should follow the jizya into the realm of abandoned anachronisms. One might then ask, of what kind of Muslim women do I approve, and love as a brother and a Muslim? 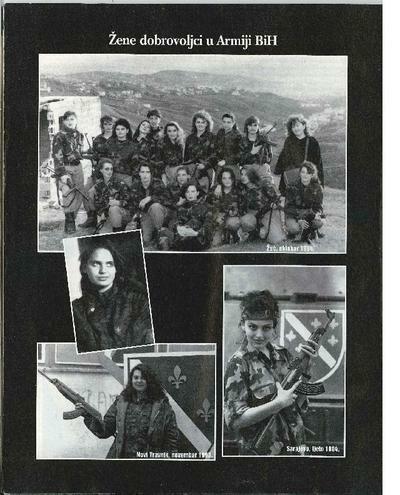 The answer is presented here in photographs of women volunteers in the Army of the Republic of Bosnia-Hercegovina during the Serbian aggression of 1992-95. As is easy to discern, these women soldiers did not wear hijab, much less radical coverings, but they fought with arms in hand for a secular state in which Muslims and non-Muslims could live peacefully as neighbors. I never forget that 60,000 Muslim women were raped in the attempted genocide directed from Belgrade. Title: "Women Volunteers in the Army of Bosnia-Hercegovina." The Bosnian Muslim woman soldier, in my view, conforms to the description of "woman as wisdom" in the Sufi classic of Shaykh Ul-Aqbar, Muhyid'din Ibn Arabi (1165-1240) radiallahuta'ala – qaddas sirrahu'l aziz, Tarjuman al-Ashwaq (The Lover's Phrasebook), of which I am preparing a new translation. "When she slays with her glances, her speech restores the dead to life, as if she, by giving life, were Jesus (Isa a.s.). "The supple flesh of her legs resembles the Torah in brightness, and I follow it and walk behind her as if I were Moses (Musa a.s.). "She is a bishop, a daughter of the Roman church, but without embellishment; you see within her the radiance of the good. "She is wild and nobody will make her subordinate; she keeps in her chamber of solitude a tomb for remembrance. "She baffles every learned scholar of our religion, every reader of the Psalms of David (Zabur), every Jewish sage, and all the Christian clergy." I recall that Nabiullah, Muhammad s.a.w.s., whose birthday traditional Muslims are celebrating currently, banished the horror of female infanticide from Arabia. I recall that Sayyida Zeynab Bint Ali a.s., the sister of Imam Husayn s.a., defied the tyrannical Umayyads who murdered her brother, and that Ahl Ul-Bayt continue mourning the martyrs of Karbala, as in their recent observances of Muharram, Ashura, and Arba'een. I recall that the Umayyads had their capital in Damascus, where the bloodthirsty regime of Bashar Al-Assad, with the approval of the Iranian clerical dictatorship, imitates the terrorism that was directed against Ahl Ul-Bayt at Karbala. I recognize with dismay that tormented Damascus is also the resting place of Shaykh Ul-Aqbar, Muhyid'din Ibn Arabi. I call for solidarity with Muslim women fighting for their rights everywhere. Without radical affectations in costume, but fighting for the dignity of their sisters and brothers, and the right to live in harmony with all. The Bosnian woman soldier deserves the respect and praise of every Muslim believer. 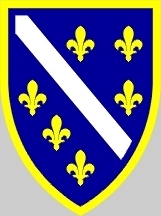 Shield of the Republic of Bosnia-Hercegovina. 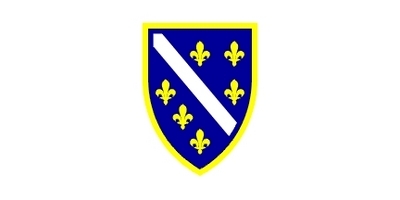 Flag of the Republic of Bosnia-Hercegovina.